I'm getting ready to head out for a much needed Girls' Night Out with a couple of close friends from work. I just realized that tomorrow was the due date for my Calendar of Events post, which is not quite ready for publication. I plan to finish and post it later tomorrow, as I ran out of time working on my Brickwall Ancestor post today. The main things to keep in mind are that March 1st is Data Backup Day (Thomas has got a great contest going!) and submissions for the 67th Carnival of Genealogy are due. I'm so glad February is coming to an end...it's been such a dreary month! I'm extremely fortunate that I can trace so many of my ancestral lines back many generations, the result, I suppose, of having so much Dutch and New England ancestry centered in locations where good vital records were kept from early times. My most recent brickwall--"recent" meaning how near in time to this present generation--is one of my maternal great-great-grandmothers, Berber "Barbara" J. DeJONG. On my ahnentafel (ancestor report), she appears as number 25, being my mother's father's father's mother. This is what I wish to know about her: I would like to know exactly where she was born, to confirm the names of her parents and any siblings she may have had, and discover the story of that family unit. I suspect that because I cannot find much information that her parents may have died young, or some other event occurred that made her appear to be an "orphan" ancestor, with no history, so to speak, until she immigrates with my great-great-grandfather, marries, and has children. Berber J. DeJONG was born 9 April 1858 in the Netherlands. This information comes from her death certificate, which states she died 1 June 1934 at the age of 76 years 1 month, 23 days , as well as from the 1900 U.S. Federal Census, which states her month and year of birth as April 1858 and her birthplace as the Netherlands . Her age and birthplace listed in the 1910, 1920, and 1930 Federal Censuses are consistent with this information [3, 4, 5], and her children's various vital and census records all give her birthplace as the Netherlands or "Holland". She immigrated from the Netherlands with her fiance, Tjamme "James" Wiegers VALK, arriving from the port of Amsterdam at New York City on the ship, Surrey, on 2 June 1882. They were steerage passengers and their names appear as "B. Dejong" and "Tj. de Val" respectively. Tjamme was from the village of Marrum, municipality of Ferwerderadeel, the Province of Friesland. There are many people with the surname DeJONG listed in various Ferwerderadeel databases, but none seem to fit Berber's family. She married Tjamme on 21 June 1882 in Rock Island Co., Illinois. Both the immigration and marriage information are consistent with the Valk oral family history. However, some minor details do not comply. Supposedly, this couple knew each other before immigration, were engaged, and married on board ship by the captain (nothing on the passenger list confirms this). 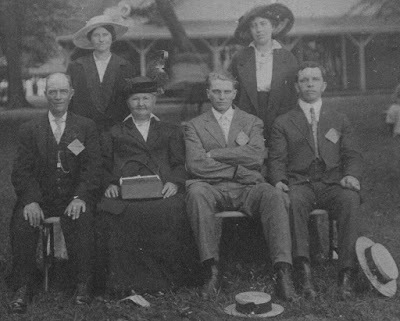 The oral family history goes on with the statement that the couple had to be married again once they reached shore, and that the Dutch community in Rock Island gave them a housewarming or some other type of bridal shower to celebrate their marriage. Possible house or house location of the Valk family in 1890. From Google Maps. 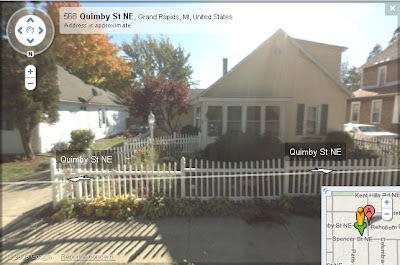 At this time, the family was living on the south side of Quimby Street in Grand Rapids, just a few houses west of the intersection of Quimby and Union Avenue, and just south of the location of the present-day Kent Country Club. On 12 April 1891, tragedy struck their household as their oldest daughter, little Chaterina, age 6, died of drowning. [21, 22] I have no details; perhaps I can request a search of The Grand Rapids Press and The Grand Rapids Herald for that time frame to see if there was any article about it. Berber J. (DeJONG) VALK with grandson Gerritt John HEIDEMA, Jr. C. 1919, Kent County, Michigan. Original believed to be privately held by John Hanson Heidema, [ADDRESS FOR PRIVATE USE,] Little Silver, New Jersey, 2000. Grave of Berber J. (DeJONG) VALK, Greenwood Cemetery, Grand Rapids, Michigan. Original privately held by Miriam Robbins Midkiff [ADDRESS FOR PRIVATE USE,] Spokane, Washington. 2009. Neither her obituary  or probate records  list any other family members besides her three surviving children. Her death certificate states her father's name as "Sjerd De Jonge" [sic - correct Dutch spelling should be "Sjoerd"]. Understanding the way the Dutch named their children for their parents and siblings, it is very likely that Barbara's mother's name was a Dutch or Frisian variation of the English "Jennie," such as Janna, Janetje, or Janke. We know that there were three attempts by James and Barbara to name a daughter after his mother (Trijntje, Chaterina, Katherine, etc.). Gertrude (Geertje) was probably named after the only other known woman in the family, James' maternal aunt, Grietje Gerrits (DOLSTRA) DeVRIES. Thus, the two attempts to name a daughter Jennie probably stem from the desire to honor Barbara's mother or other female relative. Barbara's middle initial, J, probably also is a reference to her mother, as Dutch people usually used their patronym (in this case being Sjoerds) as a middle name. In my attempt to find out more about Barbara's roots, I've researched three online database websites: Genlias (the Dutch National Archives), Tresoar (the Friesland Provincial Archives) and Efskip Terdoarpen (a personal genealogy project highlighting the resources of the municipality of Ferwerderadeel, where the Valk family lived for several generations prior to immigration). I have found a Berber deJONG born 28 May 1858 to Klaas Jitzes deJONG and Jacobje Uiltjes HETTINGA in the Tresoar index, but investigating this family closely leads me to believe quite confidently that this is not my Barbara. Because I have not been successful finding Barbara or her family in Friesland resources, I wonder if she came from the neighboring province of Groningen, which also had many people of Frisian ethnicity living there. Groningen online resources are not as proliferate as the ones from Friesland, so I should probably research microfilmed ones, although I'm not certain where to start. Perhaps church records in Grand Rapids will yield some clues, too. If anyone can give me specific ideas for research, I will be most appreciative! This post was incredibly difficult to write, due to its length, as well as the organization, analysis and citation of records. I certainly don't expect it to be of interest to anyone other than family members, or perhaps those with experience working with Dutch records. However, it was a good exercise in carefully examining what I do and do not have and putting it into an orderly timeline. 1. Michigan Department of Health, death certificate 1260 (1934), Barbara Valk; Division of Vital Statistics, Lansing. 2. "1900 United States Federal Census," database, Ancestry.com (http://www.ancestry.com: accessed 16 November 2008), entry for Barbaril Faulk, Grand Rapids, Michigan. 3. 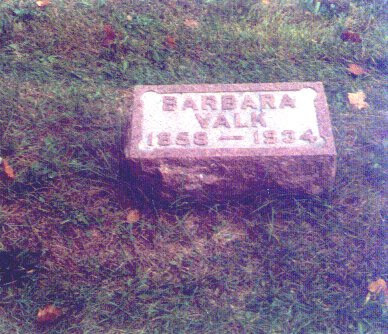 "1910 United States Federal Census," database, Ancestry.com (http://www.ancestry.com: accessed16 November 2008), entry for Barbara Valk, Walker Township, Kent County, Michigan. 4. "1920 United States Federal Census," database, Ancestry.com (http://www.ancestry.com: accessed 15 November 2008), entry for Barber Valk, Grand Rapids, Michigan. 5. "1930 United States Federal Census," database, Ancestry.com (http://www.ancestry.com: accessed 18 April 2007), entry for Barbara Valk, Grand Rapids, Michigan. 6. "New York Passenger Lists, 1820-1957," database, Ancestry.com (http://www.ancestry.com: accessed 16 February 2009), entries for Tj. de Val and B. deJong, arrived 2 June 1882, Surrey. 7. van der Ploeg, Catharinus, "Familienamen/Surnames" database, Stichting Erfskip Terpdoarpen (http://www.erfskipterpdoarpen.nl/: accessed 16 February 2009), entries for DeJong surname. 8. Rock Island County, Illinois, "Index to marriage registers, 1834-1925; marriage registers, 1833-1924," liber D, pg. 160, record no. 11976, James Falk & Miss Barbara DeYong entry; County Clerk, City of Rock Island. FHL microfilm 1,428,580, item 6. Family History Library, Salt Lake City, Utah. 9. Trijntje Gerrits (Dolstra) Valk Family Bible Records, 1883 - 1897, Bijbel, dat is De Gansche Heilige Schrift (Amsterdam and Haarlem: De Nederlandsche Bijbel-Compagnie, 1870); privately held by Elizabeth (Hanson) Heidema (deceased 2001), [ADDRESS FOR PRIVATE USE,] Clifford Lake, Michigan, 2000. The family records are written in Dutch, presumably by TrijntjeValk. It appears that the provenance of this Bible can be traced from Elizabeth Heidema to her mother-in-law, Jennie James (Valk) Heidema VanderWal, to her mother, Trijntje Valk, the original owner. 11. Rock Island County, Illinois, "Births, stillbirths, and established or delayed births, 1875-1978," liber 2, pg. 115, record no. 1478, Catrina Faulk entry; County Clerk, City of Rock Island. FHL microfilm 1,428,685, item 2. Family History Library, Salt Lake City, Utah. 12. "Rock Island and Moline, Illinois Directories, 1882-92" database, Ancestry.com (http://www.ancestry.com: accessed 16 February 2009), entries for Valk, Faulk, and related surnames using Soundex feature. 13. Trijntje Gerrits (Dolstra) Valk Family Bible Records, 1883 - 1897. 15. "Michigan Death Records, 1867 - 1967" database, FamilySearch Record Search (http://pilot.familysearch.org: accessed 28 February 2009), entry for Jennie Valk. 16. Trijntje Gerrits (Dolstra) Valk Family Bible Records, 1883 - 1897. 17. "Grand Rapids City Directories, 1889-90" database, Ancestry.com (http://www.ancestry.com: accessed 28 February 2009), entry for James Valk, 1889. 18. Grand Rapids, Michigan, Birth Records, Book 8: 255, Gertrude Valk, 1890. City Clerk's Office, Grand Rapids. 19. Trijntje Gerrits (Dolstra) Valk Family Bible Records, 1883 - 1897. 20. 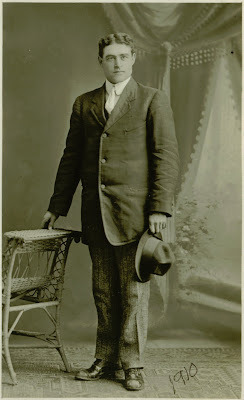 "Grand Rapids City Directories, 1889-90" database, Ancestry.com (http://www.ancestry.com: accessed 28 February 2009), entry for James Valk, 1890. 21. Grand Rapids, Michigan, Death Records, Book 3: 291, Tryntje Valk, 1891. City Clerk's Office, Grand Rapids. 22. Trijntje Gerrits (Dolstra) Valk Family Bible Records, 1883 - 1897. 23. Grand Rapids, Michigan, Birth Records, Book 10: 375, Catherine Valk, 1895. City Clerk's Office, Grand Rapids. 24. Trijntje Gerrits (Dolstra) Valk Family Bible Records, 1883 - 1897. 25. "1900 United States Federal Census," database, Ancestry.com (http://www.ancestry.com: accessed 16 November 2008), entry for Barbaril Faulk, Grand Rapids, Michigan. 26. Grand Rapids, Michigan, Death Records, Book 4: 184, Catherine Valk, 1895. City Clerk's Office, Grand Rapids. 27. Trijntje Gerrits (Dolstra) Valk Family Bible Records, 1883 - 1897. 29. Grand Rapids, Michigan, Death Records, Book 4: 306, Thomas Valk, 1897. City Clerk's Office, Grand Rapids. 30. Trijntje Gerrits (Dolstra) Valk Family Bible Records, 1883 - 1897. 31. ---, “For Small Homes There is a Demand in South and East Ends. Prices Grow Stiff and Real Estate Market is in a Healthy Condition. There Were Several Large Transfers Placed on Record This Past Week,” The Grand Rapids (Michigan) Press, 6 July 1901, pg. 3, col. 3 – 4; digital image, GenealogyBank.com (http://www.genealogybank.com : 7 January 2009), Historical Newspapers. 32. Grand Rapids, Michigan, Death Records, Book 8: 118, Kathrine Valk, 1922. City Clerk's Office, Grand Rapids. 33. Michigan Department of Health, death certificate 4481 (1912), Kathrine Valk; Division of Vital Statistics, Lansing. 34. Grand Rapids, Michigan, Death Records, Book 11: 191, James Valk, 1922. City Clerk's Office, Grand Rapids. 35. Michigan Department of Health, death certificate 1260 (1934), Barbara Valk; Division of Vital Statistics, Lansing. 36. ---, “Obituary,” The Grand Rapids (Michigan) Press, 2 June 1934, pg. 18, unknown column. 37. Kent County, Michigan , Will Book 911: 195, Barbara Valk; Office of the County Probate Court Clerk, Grand Rapids. 38. Michigan death certificate 1260 (1934), Barbara Valk. 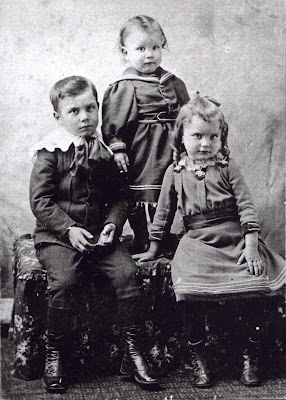 Ernest, Howard & Hazel York. C. 1900. Original photograph believed to be privately held by Nancy (Masten) Peugh, [ADDRESS FOR PRIVATE USE], Manton, Michigan. 2000. After a hiatus of four weeks, I return to this series, geared especially to new Genea-Bloggers. Last time, we talked about creating a profile and posting a profile picture in the About Me section of your blog to get your readers to know a little bit about you personally, and to easily identify you. Now it's time to take that profile photo and use it on your social networking websites. "What social networking websites?" I can hear you ask. "And why would I want to join a social networking website?" MySpace is generally geared to tweens and teens, although a good many older people use them as well. Each "space" or personal mini-website that you create can not only be used as a way for others to find you (and your blog, if you list it), but can be decorated with backgrounds, photographs and enhanced with audio files to play your favorite music. This is a great way to especially connect with younger relatives who might not otherwise know about your family history blog. Facebook seemed to originally be used by the college crowd, but has quickly surpassed that generalization and now, people of all ages and professions (or not) are using it to connect with family, friends, co-workers, and in the case of genealogists, other bloggers. Unlike MySpace pages which can be decorated with backgrounds and enhanced with audio files, Facebook profile pages have a simple, clean background without a lot of distractions. Last summer, when scores of genealogists, family historians, and genea-bloggers joined Facebook en masse, encouraged by Megan Smolenyak Smolenyak's call to join the Unclaimed Persons Group, many felt technologically overwhelmed by Facebook and its many applications. This was made especially so when Facebook switched to the "new" Facebook, changing the way that many users had just learned how to utilize the website. Thomas MacEntee, who had started the Genea-Bloggers Group on Facebook, then created the Facebook Bootcamp for Genea-Bloggers blog to offer a tutorial and explanation resource for the many ways Facebook could be used, with the eventual outcome of enhancing our blogging experience. LinkedIn is a social networking website that is geared toward the professional experience. As their motto proclaims, "Over 35 million professionals use LinkedIn to exchange information, ideas and opportunities." Your LinkedIn profile page is a great place to post your blog link and list yourself as the owner of a digital genealogical publication. If you speak, present, teach, or write in the genealogical world, you may wish to add your resume and contact information as well. I've barely scratched the surface in the ways that these social networking sites can be used to reach others (posting vintage family photos, for instance; or using We're Related or other family tree applications). I have garnered a healthy following of readers from Facebook alone, and have even gotten some of my family members to read my blog (amazing!) and comment with additional or corrected information. I encourage you to explore these sites and create profile pages listing your profile photo and the link to your blog. I especially recommend reading the articles found under the following topics at the Facebook Bootcamp for Genea-Bloggers blog: Facebook, applications, blog networks, and blogging. Next week, I'll talk about some of the lesser-known social networking sites as well as networking applications. I want to thank the following individuals for joining me for our first ever CoverItLive Scanfest: Diane, footnoteMaven, Thomas, Randy, Brenda, Cheryl, Jasia, Steve, Kathi, Amy, Ambar, Denise, Elyse, Bill, Pam, Midge, Jennifer, Sheri, Taneya and Kathy. We had a great time and not too many troubles for our first time using this new format. Some of the features I enjoyed were having many of the participants (the Producers) pre-added so that I didn't have to take the time to add them to our conversation. I liked being able to share media, such as the yearbook page I scanned. I also like the ability to save and edit the chat for future reading. However, I am disappointed that a few people kept getting dropped and hope that we can figure out exactly what the problem was to prevent similar situations in the future. Another feature from Windows Live Messenger that I missed was seeing a list of the current participants on the side of the screen. If you missed Scanfest, you can read our chat conversation by going to the actual post on my blog (but not through a feed reader such as Bloglines or Google Reader), and clicking on the Replay arrow. It streams like a video, but it's not really one. I'm going to try this format again in March, Sunday, March 29th, to be exact. We'll start at 11 AM Pacific Daylight Time and finish at 2 PM. Hopefully, I'll get a bit more scanned next time as I won't be on such a learning curve! Every Saturday night, Randy Seaver posts a fun activity at his blog, Genea-Musings. Last night, he asked us, "Who's number 21 on your ahnentafel list?" Number 21 on my ahnentafel is one of my paternal great-great-grandmothers, Mary E. "Mae" (McARTHUR) YORK RANDELL RICHMOND, (1875 - 1959). I've written quite a bit about Mae over the years. You can read my original AnceStory about her on my website here. Photographs of Mae appear here and here. 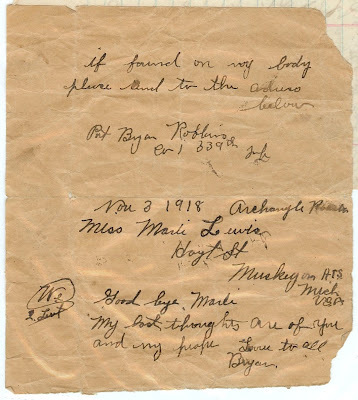 After writing in October 2007 about the mystery of Mae's marriage to her first husband, my ancestor James L. YORK, I was able to write another post in March 2008 exclaiming my delight in finding their marriage date and place. And in May 2007, Mae appeared as a part of my series on finding my ancestors in the 1930 U.S. Federal Census. 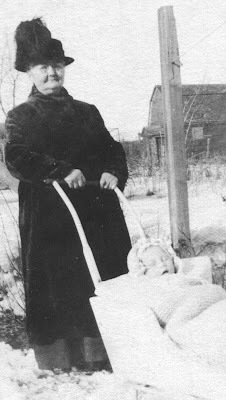 Way back in February 2006, I found her entry in the Gratiot County, Michigan Birth Records. I also wrote about how I was able to find her death and burial dates by contacting the sexton for the cemetery where she was buried. My husband's number 21 is Rebecca Catherine (SNOOK) WESTABY. While I don't have an AnceStory about her, her obituaries appear on my website here. As part of a research log, I blogged about how I requested them through Random Acts of Genealogical Kindess in December 2006. In May 2007, we were able to locate and visit Rebecca's grave. I submitted a story about Rebecca's buttonhook for the 2nd Cabinet of Curiosities in December 2007. In February 2008, I posted a photo of Rebecca in an old general store for one of my early Wordless Wednesdays, followed by an explanation the next day. 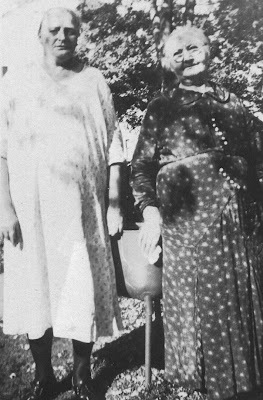 Another photo of Rebecca and her daughter Izma can be seen here. Thanks, Randy, for this fun activity. It's nice to remember that I've researched and written so much about this generation! Also thanks to Olive's Granddaughter of Grandma's Stitches for blessing my AnceStories2 blog with this award. 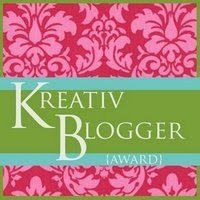 So many bloggers have been given this award that it would be very difficult to find more to tag. But thank you, so kindly! The February 2009 Scanfest will be held Sunday, February 22nd from 11 AM to 2 PM, Pacific Standard Time. Instead of using Windows Live Messenger, we will be using Cover It Live, a live blogging format that you access right here at AnceStories. It really is easier than it sounds, and we shouldn't be having the issues we had with Windows Live Messenger dropping participants. I'm looking forward to seeing you all there, getting some scanning done, and using the new format! Westaby, George Rice III. 1910. Original photograph privately held by Troy Midkiff, [ADDRESS FOR PRIVATE USE], Vancouver, Washington. 2009. Celebrating the 2008 iGene Awards, you can read it here (I didn't participate this time) and find out what the theme for the 67th Edition will be! A year ago, I posted "Confederate Pensions Databases" on this blog. With the addition of Ancestry's new database, "Georgia, Confederate Pensions Applications, 1879 - 1960," I thought I would check to see if there was any additional information or corrections I needed to make to this list. There were, and I have updated the post. You can read it here. I'm slowly easing back into blogging, as you can see. I'm not ready to publish the next segment in my "Getting More Traffic to Your Blog" series tomorrow, but hope to continue next week. Meantime, you might like to read this post, "5 Tips for Increasing Blog Subscribers," by Traci Bisson at Bizzy Women, a business woman's blog. Currently, I'm working on my first Brickwall Ancestor post, which is taking a surprisingly long amount of time to complete. The main slowdown is citing all my sources correctly, and in doing so, I'm discovering a few minor errors, which by correcting are so far not yielding any new clues (darn it!). A couple of carnivals have recently been published, with a couple more due out any day. The most recent releases are the 3rd Edition of the Canadian Genealogy Carnival ("Around the Kitchen Table") and the 10th Edition of the "I Smile for the Camera" Carnival ("Costume"). Enjoy reading these, as I have, and then get thinking about posts to submit for the next editions! A new-to-me history blog that I'm excited about is the Ravenna [Michigan] Area Historical Society Blog. Ravenna is one of my ancestral locations, and I sent the link to my dad and his siblings, knowing they would enjoy it as well. They used to spend part of their summers at the family cabin at nearby Crockery Lake, and my great-grandparents were instrumental in establishing the VFW post and Ladies Auxiliary in the area. Another interesting history blog is Firelands History, which tells the story of the settlers who came from Connecticut to Ohio. My PHILLIPS and DICKINSON families would have been a part of this migration, so of course, it holds personal fascination for me as well. Our beloved Grandfather Genea-Blogger Ernie Margheim is taking a two-week break from blogging while he spends some time in the hospital. Drop on by his wonderful blog and wish him the best of health, and then take some time to read his old posts if you haven't discovered it already! His story-telling reminds me of my own Grandfather Robbins', whom I still miss very much. Those of you who've been around for a while will be glad to see that Barbara is posting again at Our Carroll Family Genealogy after a long hiatus! Welcome back, Barbara! Dr. Fitzpatrick is world renowned for her expertise in solving the cases of "The Hand in the Snow" in Alaska, "The Unknown Baby from the Titanic," and in helping Dr. Ken Waltzer expose the Herman Rosenblat Holcaust Fraud. Space is limited so pre-registrations must be in by May 16, 2009. This is a partial repeat of a post, 3. Bryan and Marie - A World War One Romance, from my "Polar Bear in North Russia" series. After a week's hiatus from blogging, accompanied by babying my shoulder whenever possible, I am feeling somewhat better. Yesterday I returned to my surgeon and voiced my concerns about the increasing shoulder, arm, and upper back pain I've been experiencing since I've returned to work a month ago. He assured me that my situation was not uncommon and agreed with the theory that my physical therapist and I had developed that my workplace ergodynamics have forced me to work at chest and shoulder level rather than waist level (i.e. I'm short! ), aggravating the muscles and tendons that are either not ready to be worked or are still healing. My work stations will be assessed to see what can be done to alleviate the situation, and I've been prescribed a week's worth of steroids to reduce inflammation. Meanwhile, though I feel ready to return to blogging, I am looking at my daughter's upcoming college application deadlines, financial aid paperwork, and submitting our income tax returns all this coming week. I also have a two more upcoming genealogy classes I'm presenting soon. Time restraints will be preventing me to get these necessary tasks completed and put any time and quality effort into blogging for at least another week, although I may slip in a press release or one of my "This and That" columns, neither of which require much time or deep thought to create. I'm taking a self-imposed break from blogging for one week. My shoulder has been getting progressively worse since I started work a month ago, in both the intensity and duration of pain as well as the involuntary movements and muscle spasms I'm experiencing--identical to what was occurring in the weeks before surgery. Last night was the worst night, painwise, I've had in the eight months since all this started and I can't continue blogging, working, driving, doing paperwork, and keeping house without risking injury or worse. Something has to give for a bit, and I'm hoping a break from blogging will relieve the symptoms some. I'll still be online, as I can read other blogs and my e-mails and publish my comments. It's just keyboarding that is stressing my left shoulder and arm, and while it's possible to type with just one hand, it's too frustrating for me to go that slow. See my 2007 posts here. Read the latest "Today is Backup Day!" post by Thomas MacEntee of Destination: Austin Family. Also read "Effective Ways to Backup Important Data" by Monika Mundell at Dumb Little Man- Tips for Life. Read the February 2009 Scanfest post. From the old town truck.